5th April – Dome pattern work progresses! 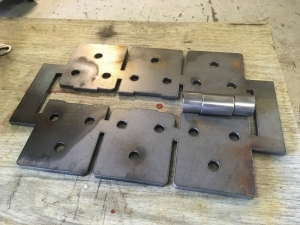 26th March – a first glimpse of the new cylinder cover plates which will be positioned at the front of the locomotive just below the smokebox. 9th March – MORE METAL ARRIVING BY THE DAY! 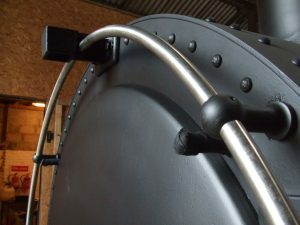 A preview this week from Jamie Keyte on work progressing on the running plate for the front of the locomotive and the sides as far as the end of the smokebox, together with the ‘piano front’ which sits below the front of the smokebox and acts as a cover plate for the ends of the inside cylinders. The giant size hinges are there to open the cylinder cover plate to give access to the cylinders and tail rods from the front. 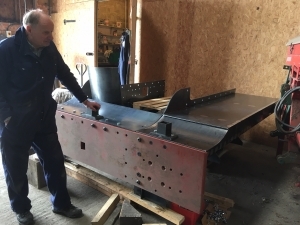 We know it resembles a flatpack at the moment but we can’t wait to see it all put together with the smokebox and bufferbeam already made -it will be really striking and we plan to have it on display at Crewe on 8 June and in July and August at the Crewe Heritage Centre. 24th February – DATES CONFIRMED – The front part of the loco will be displayed at Crewe in the summer (at LNWR Crewe on June 8 and at the Heritage Centre in July and August). With a welded firebox, increased water space over the full height and modern rules on ligaments we can just about get the original LNWR tube layout in, maybe just losing a couple of small tubes either side. Thinking about possible improvements, an extra row of flues might be considered; however the three rows of flues reduced the number of tubes from 309 on the Precursor to 159 on the George, suggesting that 32 flues would leave room for only 109 tubes There would be a reduction of heating area, and possibly a need to recess the tube plate for a larger superheater header. Such a drastic revision might prove too much. It would certainly increase costs significantly. Modifying the flues to reduce the rear end swaged-down length to 6” (as Stanier standard) might allow slight lengthening of the elements, increasing the length inside the flues by 7 or 8%. Further benefit might come from increasing the bore of the elements to 1¼” from 1⅛”, giving 10% increase in heating surface and 23% increase in cross sectional area. Steam would pass more slowly, increasing heat transfer. One snag might be the reduced free area in the flues, potentially reducing the gas flow. Perhaps the 5⅛” flues of most LMS engines would ease this a little. None of this should cost much. Length between tube plates is 12’-2¼”. The 2A boiler had 5⅛” flues, 1⅜” elements with 13’-0” between tubeplates, which suggests we are in the right area. Note that the numbers of tubes is estimated, and it may be necessary to fit fewer when the layout is done. 8th February – PREPARING FOR OUR DISPLAY AT CREWE! Today the contract was put in place with Keyte Smith Ltd., Woodborough, Nottingham for production of all the ‘new’ parts. It is intended that the whole assembly will be on display at Crewe Heritage Centre during July and August as part of an exhibition on the history of Crewe Works. Steam Railway is doing an item on the latest work on the front of the loco and the fact it will be displayed at Crewe Heritage Centre in July and August. This should be in either the March 1 issue or March 28. 17th December – LNWR GEORGE THE FIFTH STEAM LOCOMOTIVE TRUST appointment of director MR TERRY MCMENAMIN was accepted by Companies House! Congratulations Terry – welcome on board! 13th December – Boiler update: We are progressing with the design of the shell with accoutrements (such as dome plinth and mudhole). 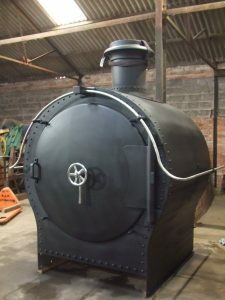 Once we put a dome on top to give us a visible, dramatic boiler profile for publicity purposes (together with the smokebox and chimney) we will have a very impressive boiler outline considering we started the new build project from scratch as recently as 2012! If affordable at this time, the foundation ring could be included as well; a symbolic start on the firebox which later will be built around. We are also shortly to work on the front of the loco to make it suitable for display at Crewe Heritage Centre during July and August. There needs to be a plate over the ends of the cylinders and some additional running plate around the front of the loco above the buffer beam. 17th November – 5 members of our group attended the annual LNWR Society Luncheon (see below). This is a regular feature in our ‘meet supporters’ timetable, which we find very valuable. We have held other such events elsewhere in the Midlands, at Kidderminster, Stone, Derby and Quorn, and that we plan to hold such events for supporters both South and North of this middle England ‘belt’. Derek Buckles gave a brief talk about his reasons for being a passionate supporter of the project and as you can see from the photograph a signed LNWR portrait was auctioned to increase our funds. Good afternoon ladies and gentlemen, thank you for allowing me to address you here today. May I please have the lights down? Now I would ask you all to close your eyes for a few minutes. Derek, a six year old, his mother, and his best friend Graham are walking to school one day in 1957. Every weekday they walk the 2 miles through the estate, across the football pitches, and then finally through the station subway to arrive at the Infants at 9am prompt. As they reach the subway under the four tracks Derek’s Mother says – hurry along boys or you’ll be late for assembly! Graham adds – please please Mrs Buckles then we will RUN all the way!!! Mother replies in resignation – just for a minute then BUT we must not be late for assembly (again). Derek says to Graham in triumph – great! – Come on Graham, I know just where to stand so we can see the wheels go over us! Thank you – I hope you enjoyed journeying back with me 61 years to one of my sharpest memories of life at Roby. We lived just 6 houses from the railway and I could trainspot from our back garden and from the school playground. Many of you will know that the village of Roby is on the Liverpool – Manchester main line – a line with an ancient pedigree going back to 1829. The locomotive in question could have been an LMS black five or a Stanier tank, possibly even a Royal Scot – BUT – it was NOT an authentic LNWR locomotive as I was born too late! I feel somewhat cheated. In fact the only LNWR locomotive I can recall seeing in my trainspotting days was G2A 49375 languishing at the back of Edge Hill shed in January 1965 it having been withdrawn back in December 1962. I wonder why it lingered there for so long – any ideas please see me later. Had I been born 25 years earlier the locomotive hauling that train might well have been one of the Famous ‘George The Fifth’ locomotives built at Crewe between 1910 and 1915. With the last of the class being withdrawn in 1948 –BUT NONE WERE SAVED. A Saturday morning in Berkampstead – little Bruce is playing football with his brother, parents and great grandfather. Not too far away is the London Crewe main line. Suddenly a whistle is heard and they stop playing. The boys run to the fence as a gleaming PRINCE GEORGE swiftly passes – what a sight! Great grandfather has a tear in his eye as he explains the significance of the event. Whilst there are a great many LNWR artefacts either still in use or preserved, no 20th century LNWR express passenger locomotive exists. So this scene can NEVER OCCUR – UNLESS THIS SOCIETY HELPS TO MAKE IT HAPPEN! We at the ‘LNWR George The Fifth Steam Locomotive Trust’ are working hard to build a fully working replica which we hope will be commissioned here in Crewe – just like its forbears over 100 years ago. You have on your tables leaflets detailing our group and the extent of our progress made to date. Or by simply supporting us financially. Thank you for your time; let’s give future generations the chance to witness at first hand the sight and sound of the Premier Line and in particular Prince George – over to you! 16th November – The Trustees held a very constructive meeting this evening. We are looking forward to tomorrow’s LNWR Luncheon here at the Crewe Arms. . I would like to give a kind word to the Crewe Arms Hotel (a historic LNWR hotel dating back to 1846) who host this event so well each year. I would also like to bring to our readers’ attention the fact that they have a fantastic picture in their lobby/lounge close to the magnificent fireplace showing Georges George the Fifth and Coronation arriving at Crewe works with the royal train in 1913. This visit of King George V and Queen Mary is believed to be the first time a reigning sovereign visited a railway workshop. 11th November – You will be aware the above comes up this coming Sunday. May we explain that we are recreating a genuine WW1 locomotive, hence a genuine direct link with this part of our past. Locomotive 2370 Dovedale, the last George to be built (before ours), appeared in 1916 and was finished in unlined wartime black. We acknowledge ‘Warwickshire Railways’ as the source of this photo. 8th November -Liverpool Pals memorial dedicated and unveiled by Prince Edward. The Pals memorial depicts them leaving on a train hauled by a Precursor, the original concept on which the George was based (and to which many Precursors were subsequently rebuilt). The two friezes are hung high up above the entrance to the Wirral Line escalator on the station concourse in an elevated position. One depicts ‘The Home Coming’ with an LNWR George V locomotive. 17th October – At last we have a welded handrail. As its a little over 6m long its a good job someone has a suitable boat trailer! Next job is to get it down to Hickling and hot work the two corners. Then a spray coat of black, mount the chimney and stand back to admire the view. 24th September – Waiting for the welder to come back off holiday so he can stick the two halves of the handrail together. Made a lovely bending jig last week so the final bend (the one which takes the handrail parallel to the boiler) is in exactly the right place…. Will take some pics when we get to the bending part. 30th August – We have been sharing ideas with LNWRS and we have full support to go forward with our group on a permanent display at Crewe! Crewe Heritage Centre is a railway museum located in Crewe, England. Managed by the Crewe Heritage Trust, the museum is located between Crewe railway station and Crewe town centre – WATCH THIS SPACE FOR MORE NEWS! 22nd July -CONGRATULATIONS! Congratulations to Prince George on his 5th birthday , His name was conferred on our loco on his first birthday. 21st July – Paul Hibberd (Trustee) gave a talk to the London & North Western gathering at Kidderminster Railway Museum at Kidderminster (SVR). 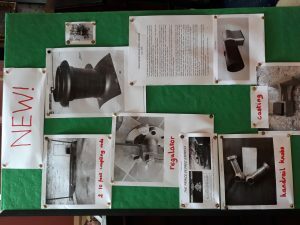 Many of our supporters were there and Paul used the board shown below to highlight the amount of progress made in the last year, two ten foot coupling rods, the chimney, the regulator, castings and knobs and not least substantial work on the design for the new boiler. There is no doubt that tangible progress generates positive morale and a belief that the project is actually happening in a meaningful way! We even got some money in as well. 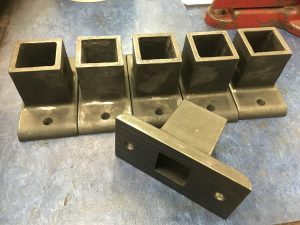 7th July – lamp sockets now fabricated. 17TH JUNE = FATHERS’ DAY – WHY NOT GET HIM A MEMBERSHIP PACKAGE? 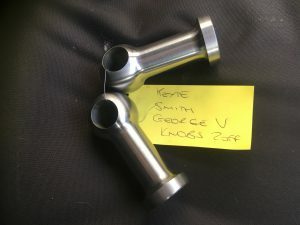 11th June – See picture below of very fine knobs for the George collected today from Statfold Engineering. They will attach the handrail to the smokebox. 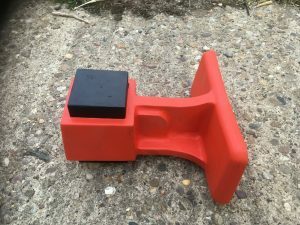 7th June – Handrail knobs are ready – just need to be collected. Castings are awaiting SG material to come in and are expected next week. 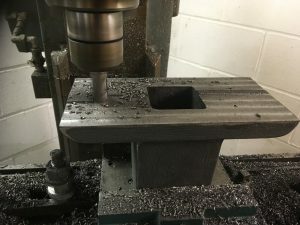 The bracket will need a bit of machining (there is a draft angle on the back plate which needs to be taken off, and the holes putting in) and then they can go to the benders. These items need to be threaded onto the handrail prior to the tight radius bends being put on. We have the whole of page 12 giving us coverage. There is a letter from Paul Hibberd (trustee) expressing appreciation for the late Brian Hayes’ enthusiasm for our project and his view on its relevance to the LNWRS. There is a progress report from Peter Stanton referring to our cooperation with the coal tank people at Keighley and there is a giant sized photograph of the completed chimney. Lovely to see us being taken seriously by LNWRS, which is a hugely important relationship for us. 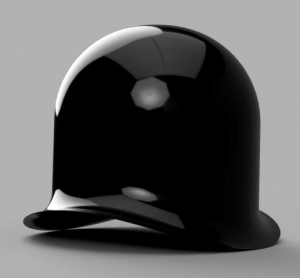 25th May – Orders are with Statfold for the handrail knobs. The lamp socket pattern is done and was dropped off at the foundry this morning, along with the pattern for the buffer beam sockets. They will be cast in SG iron. We suspect the originals would have been standard grey cast iron which might be a bit vulnerable to knocks (railwaymen do tend to use a hammer as a universal tool). 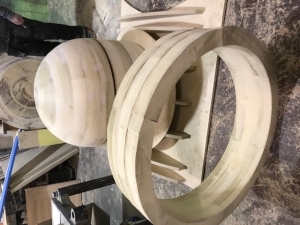 The handrail can’t be done until the other parts are machined as they will need to be threaded onto the large radius curve before the ends are bent. Spring 2018 – article published in the RSA magazine. 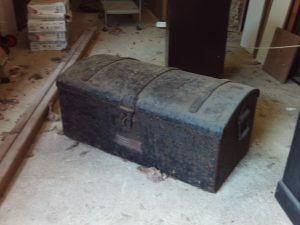 14th May – We took possession of an LNWR loco toolbox and LNWR design regulator and quadrant. In particular the regulator is a direct and symbolic historical link between our loco and the original LNWR. 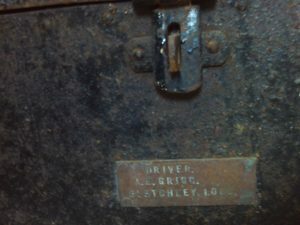 The toolbox carries the name of a Bletchley driver who became a fireman there in 1941. Four Georges were withdrawn that year and we wonder if any of those were Bletchley based. If so he may have worked on a George! Our project was promoted at this event on May 11, May 12, May 13. We had a joint stand (see below) with the LNWR Society. 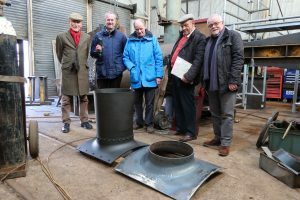 5th April – 0ur Treasurer Paul Hibberd and Engineer Terry McMenamin visited the KWVR at Ingrow to borrow lamp socket patterns. Pete Skellon and Steve Allsop were very helpful, and allowed full access to the Coal Tank. Although No 1054 is a Webb engine, it was useful to see and photograph various standard LNWR items. 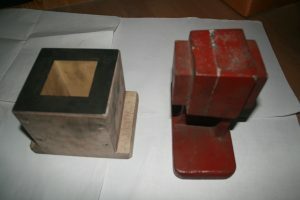 This week the lamp socket pattern will be off to the foundry to make the sockets for the buffer beam. The pattern for the smokebox one needs some alteration, respecting the Coal Tank requirement which has a different offset to the George. The order this week will be for six castings, three for the front buffer beam and three for the rear of the tender. On a different topic, our chimney assembly (including cutting the capuchin) should be completed shortly, and after painting should be ready for display. 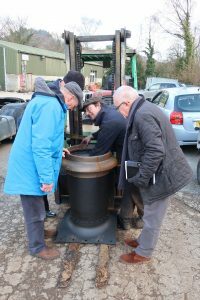 23 February – Trustees at Cromford to take delivery of the chimney from Israel Newton and Sons Ltd. The chimney has now been mated with the Capuchon. We hope to be able to arrange for the Original Whistle to be made serviceable BUT to stay in LNWR black. We aim to update this list annually. 12 February – At the moment we are in the process of finalising force calculations for the motion. Starting from the piston valves, and now on the tail end of the lifting link and hope to finish that today or tomorrow. Next week should see the jack link and anchor link finished. After that we will need to do several illustrations to show just what is going on for each link. This is part verification that the calculations are OK but also a justification of the spreadsheet. However after next week the intense part of the work is over. We hope then to make 2D drawings of Richard Cook’s 3D model of the smoke box handrails and steam pipes, and get them made. 8 February – Chimney Base Plate ready for collection! If the George bogie is the one fitted to the Claughtons (and then re-used on Patriots and Crewe-built Jubilees to February 1934 – i.e. 5552-6 and 5607-5654) then we have a chance to use that as a basis for approval. However, the preserved locos are 5593, 5596, 5690, 5699, all nicely outside the range we want. Despite that, the bogie being in service till the end of steam counts for something. We need to catalogue the applications, fleet numbers, axle-loads, dates of introduction, scrapping dates and service type. From this we can start on a justification. Some areas will be subject to change anyway – it seems bonkers to spend money on the curved slides ‘radial guides’ as it means the front and back guides are different. Roller bearings mean bigger horn gaps, and square section side control springs are out, unless we want to spend lots more for a worse outcome. We need to review the pivot too, to check it will control roll. If necessary, alterations may be required there. It seems we may have to do quite a bit of justification either way, but on the other hand a full stress analysis of the bogie is not a minor job. For the bogie wheel, the news is less good. Probably we will have to fully meet the modern load case. Any relaxation will be minor, in which case we may as well go for compliance. Bolted or riveted tyres are out, double-snip tyres as per Bulleid are accepted at a push, otherwise Gibson rings. My judgement as ex BR’s former wheelsets man is that the latter is entirely justified. Gibson rings would be hard to fit to the bogie wheel, and the small diameter means the inner snip height is limited – not good. 2 January – A CAD drawing showing the hand rail which is to be added to the smokebox which we have already produced. Check for approved tyre suppliers other than SDR (with bogie wheels in mind). Done, British Wheelsets are approved to supply tyres made in Germany, so there is at least one other supplier. Set up a discussion with technical specialist regarding the Boiler. In progress, We have sent them our draft spec and asked for comments. 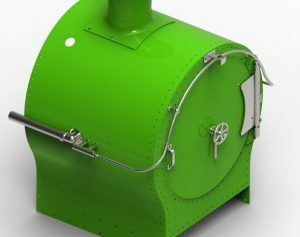 Following specialist’s comments we meet potential boiler manufacturer(s) to discuss the facets of our locomotive boiler design. Make contact with various specialists who have done similar design work previously. 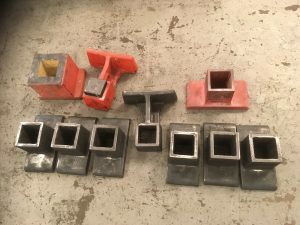 The coupling rods are forged and we await notification that heat treatment and testing have been completed, also certificates for mechanical tests and NDT. The justification for the coupling rods is with an acknowledged expert for consideration and approval. Once this gets the OK the same load cases become the ones to use for all the machinery, one of those items which are unseen but really very significant for the project. Another of our volunteers has been working on the bogie wheel stresses and managed some improvement. We hope to discuss this with our ‘acknowledged expert’ soon when we review the coupling rod calculations outcome. The aim would be to get the entire roller bearing wheelset approved before proceeding with any procurement as there is so much interdependency. 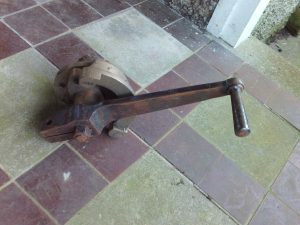 It is also on the learning curve for the Big One – the crank axle. By Easter maybe for the bogie wheelset? We might also raise the question of the degree of scrutiny needed if it turns out that the LNWR bogie is fitted under any of the preserved Jubilees. Also we have got preliminary modelling of the crank axle to discuss. Another of the team has produced a 3D model of the as-built motion, which is good publicity material and provides us with mass and inertia data for calculation forces in the valve motion. Our Repository is up and running. The new Heritage standards are issued. There is to be a joint ORR/RSSB/AST day at the NRM to present these. We need to go, for networking as well as for the standards themselves. 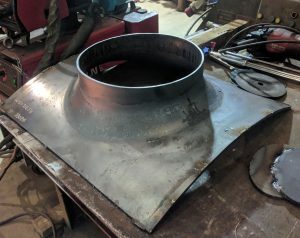 The chimney base and tube should be complete soon so we can add the cap and fit it to our smokebox. We were saddened to learn of the death of Brian Hayes, one of our Trustees, on 15th December. Brian Hayes was certainly by inclination an LNWR man, being in fact chairman of our sister organisation the L&NWR Society. Brian was a faithful and knowledgeable member of our own Trust becoming a Trustee in January last year and being a regular attender at our meetings and internet ‘chats’, despite the inconvenience of living in Oswestry. He was always ready to assist and was able to ask the most appropriate question based on his life on the railway, he had a most inquisitive mind! Brian worked for the LMS having begun as a booking and enquiry clerk at Birmingham New Street Station. His qualities led his being selected as a Traffic Apprentice, the scheme whereby the company showed young men the ins and outs of the entire system and expected them to learn the jobs. He was first allocated to London Road Manchester (later Piccadilly), to learn his trade. He then moved through various jobs involved with operating the railway. When the British Railways Board set up an enhanced Freight Rolling Stock team to take advantage of TOPS Brian was appointed as one of the Inspectors. This was a seminal time for British Railways as it wrestled to come to terms with the vast expenses of the wagon fleet and traditional methods of operation. Brian eventually left BR in the mid-1970s having been appointed to a job in which he and his superiors did not see eye-to-eye! Brian left BR for the Church of England and became an ordained priest. He was appointed to a parish close to Bury St Edmunds and subsequently served for many years at parishes in the Diocese of Lichfield. Retiring about the age of seventy, he moved to Shropshire where he lived in a village close to Oswestry, anf then Oswestry itself. He had not been well for the last few months but continued to be closely involved in the Trust. He finally fell ill while travelling to a Trustee meeting and was taken to Milton Keynes Hospital where he died on 15 December at the age of 84. Both societies owe Brian a great deal. The LNWR George the Fifth Trust has sent through some interesting updates to New Build Steam. They have recently taken delivery of the coupling rods, plus the chimney cap, with the chimney base and stem now on order. A drawing for the machining of the coupling rods has been completed. Away from the cutting of metal, the group has been undertaking substantial work on some crucial areas of technical analysis, including both to reduce weight and to enhance safety. Modern analysis shows that the class’s motion gives excellent valve events, but also that many components were needlessly heavy – today’s design and manufacturing techniques will enable metal to be put where it will be most effective. Another reason for this work is that Network Rail, the Office for Road and Rail and the Rail Safety and Standards Board are aware of the vulnerability of the connecting rods on some LNWR locomotives, fractures of which occasionally led to penetration of the boiler, as at the Betley Road accident of 1923, whose cause was bluntly attributed to ‘poor design’ by the ensuing investigation. The locomotive involved was of the ex-LNWR Prince of Wales class, which the group’s work suggests was more compromised by its design than was the George. Further outstanding issues that the group has identified for resolution are gauging for main line use, hammer blow, and the axles, including the crank axle. Over and above the engineering matters, on which Terry has already so capably reported, we also had quite a thorough discussion on the other matters listed in the agenda. 1. Website progress and comments. We were both impressed with the material from Derek. We both felt it might be helpful to have a page giving details of our suppliers with their logos etc. We also felt that it might be helpful for Derek to be supported by Bruce and Paul re the practicalities of what has been proposed into a fully finished product. 2. Where we want to be as a short term objective. A It is obviously an imperative to send out a new update on progress to all our supporters. It is obvious important to work out exactly how we are going to do this in the current circumstances (Brian had just been taken ill). B We need to increase the size of our team. 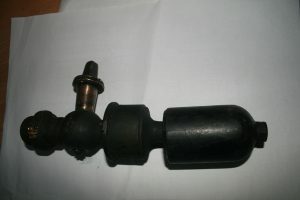 The Steam Railway advertisement for this purpose was discussed and the version previously shown to Bruce was felt to be acceptable (an advert subsequently appeared in the January 2018 ‘Steam Railway’. 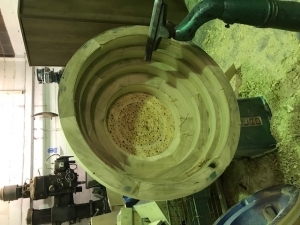 C The importance of progressing the boiler barrel to demonstrate tangible progress was particularly appreciated. 26 October – Our repository now has a drawing list of all that appear relevant to our project. First draft calculations for balancing is complete. Having input the masses and inertias of each reciprocating component as derived from CAD modelling, and assuming ⅔ of it was balanced on the leading axle, I get a force at 6 revs/s of 148kN, as compared with 141kN (10kN = 1 ton near enough) reported by the Bridge Stress Committee in 1926. Obviously these figures are way beyond anything allowed now the railway knows about the problem. It was OK with Sir Richard Moon with average speeds of 40 mph so it was assumed OK at any speed! If we balance equally over the two driving axles we halve the hammer-blow; then if we reduce the weight of reciprocating components by 40%; add a reduction in mass balanced to 40% we reduce hammer blow to 27kN, and still compared to the original have less out-of balance horizontally. OK, mass reduction is a challenge, but at least we have a handle on it now, we can ask what speed we would be allowed and set objectives accordingly. June – Having got the LNWR George drawings from the NRM, we can see that there is a slight difference in chimney design coming into use in the early 20th century. Not much, but enough to get us into trouble with the authenticity police! Attached an illustration of 3-D models of the chimney as built, and one of reduced height for NR running. The latter uses the same cap and base, and is a Claughton chimney just made half an inch shorter. To my mind this seems more satisfactory than faffing about trying to lose a bit of height on each individual component in a probably doomed attempt to disguise the reduced height. At least we can claim some authenticity as a Claughton chimney, just don’t let anyone near with a tape measure! Just for comparison I have included part of the profile we had early in the year, which seems to have been a Webb chimney. Probably the pattern for the cap and the press tool for the base needed renewal? We can soon price the cap, and Newtons are looking at the base for us. 25 April – As a project aspiring to main line operation progress on the LNWR George the Fifth has been dominated by uncertainties with regard to ORR requirements which hopefully will shortly be resolved. To this end the LNWR George the Fifth Steam Locomotive Trust is preparing a statement of how it plans to proceed and inviting ORR comments. (a) BOGIE WHEELS. Detailed analysis has shown that the original design (used from 1906 until the 1960s) needs minor adjustment to its spokes profile to conform with the current regime. The interface with the axle may also require further work due to the size of the central boss in relation to the wheel diameter. (b) COUPLING RODS. Assessment in respect of the forces applicable is close to completion and we could proceed if they were being forged but we would prefer water jetting as a safer process. One issue still requiring clarification is the final finishing process required (it appears that hand finishing as used on Beachy Head’will not be acceptable. (c) BOILER SHELL. Alan Haigh has been extremely in working from the original drawings and producing an equivalent which complies with modern regulations.Further wor is being undertaen in respect of his 1A proposals which correspond closely with the original scheme (which was a success) and it is hoped that we will be able to go out to tender for the shell later this year. (d) CHIMNEY AND DOME. 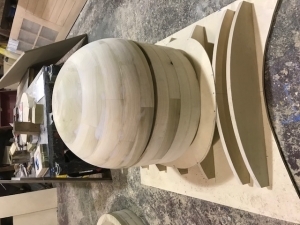 The boiler shell will create great visual impact for the project and it is intended to enhance this by production of a chimney and outer dome cover to the original design. These will be removable and suitable for heritage line use only but they will display to maximum effect the original splendid proportions of the locomotive. Progressing the project with speed requires both engineering and financial inputs. For the engineering CAD experience is particularly welcome and offers of help should in the first instance be communicated to paulhibberd@gmail.com. Financial donations should be sent to LNWR George the Fifth Steam Locomotive Trust at 62 High Street, Buntingford, Herts. SG9 9AH (as we are a Registered Charity gift-aiding is available where applicable by completing the necessary form which we can supply). May – Joint meeting held with L&NWRS at Stone. A presentation of slides was made which widened the knowledge of those present into the workings of the class. March -Group newsletter distributed with L&NWRS Newsletter number 181 and received valuable editorial support. November – We had a stand at the Midland Model Engineering Exhibition near Leamington Spa. We were well represented with a model of ‘Ptarmigan’. In addition to various LNWR photographs there were a selection of views showing progress. Many positive comments relating to this venture were received, and ‘fliers’ in respect of the project were freely distributed. September L&NWRS Newsletter – At the conclusion of our AGM on 6th June an interesting presentation was given by Paul Hibberd regarding the progress of the ‘George V New Build’, and valuable discussion took place relating to various aspects of the construction techniques and the challenges presented. March L&NWRS Newsletter – The Society is continuing its close association with the ‘New Build George V Group’ and it is rewarding to know that quite a few members support the venture in a number of ways. 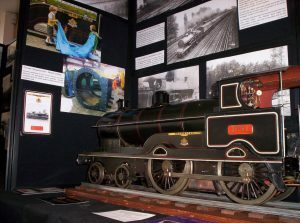 The nameplate ‘Prince George’ together with completed parts of the locomotive were exhibited at the Alexandra Palace Model railway Exhibition; and the ‘George V Group’ had a slot the following Monday on the BBC1 ‘One Show’ and a mention on both Radio 2 and 4. This is also good news for our Society as it brings our ‘aims and objects’ to the attention of a wider audience. November Steam Railway (issue 433) article ‘A new ‘George’ in TEN years? 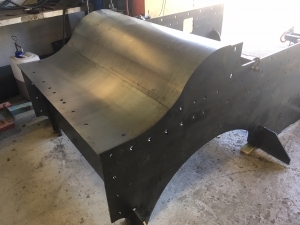 September L&NWRS Newsletter report – We have started making significant pieces of the locomotive with the unveiling of the large cabside pieces at Quorn (GCR). I was able to sit in on the 1pm talk about the ‘George the Fifth Project’. Brian Hayes welcomed Paul Hibberd (one of the original directors of the project) and Tom Mainprize, but stressed for the LNWRS members that the quest to build ‘a big model’ was financially totally independent of the LNWRS. The unique project proposition is that this is a pre-First World War design for the mainline. The class had the highest HP output per ton weight of any loco on the WCML up until the end of steam. So it ought to be able to haul an economic load on tours. The smokebox door was started in 2013, as a physical embodiment of the LNWR essence. 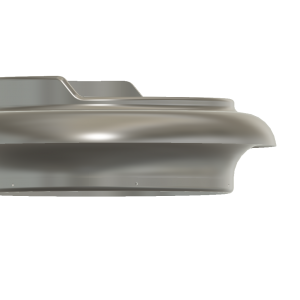 The front frames are on order (from the front buffer beam to just in from of the driving wheels) strengthened from the original 25.4mm to 30mm. There has been one enormous piece of luck, the that the Cambridges named their first born GEORGE and they agreed to the loco being named @PRINCE GEORGE’, so long as this was done “after he attains his first birthday”. The plates have subsequently been fitted to the cabside plating and look superb. “The National Lottery won’t touch new-builds, but we use Gift Aid and have (private) 100% match funding for what we do raise.” A lot of help has been offered by other groups. The SLS managers of the model ‘Orion’ have offered to help with the Joy valve gear. There is a lot of debate about the inside axle bearing (removed in their later lives), but “we are firmly of the view that the carrying structure was very important to the frame integrity, whether or not we fit the bearing. We need a reliable and faithful George!” The presentation wrapped up on time at 2pm. Present: Derek Buckles, Paul Hibberd, Bruce Nixon. The financial situation as at the year end (31 January) was considered. The situation was duly noted and the meeting closed. There are so many ways to start a communication of this kind! They can vary greatly, and this one starts with a big ‘THANK YOU’ The George the Fifth project has previously resisted communicating until we have had real news to publish, often leading to periods of silence. Our strategy has been one of waiting until significant milestones are reached. During the early stages in such a project this seemed entirely sensible. The milestone of the Kidderminster meeting cannot be overestimated for the project; this is our defining moment – THANK YOU. The event at the Kidderminster Railway Museum raised over £3,000 (before gift-aiding) thanks solely to the generosity of the L&NWRS members. Be in no doubt, the project is moving forward rapidly and as detailed below, gaining momentum. This is an achievement only made possible by the L&NWRS membership. The synergy between the two groups is such that it will surely last deep into the 21st Century. The £3,000 raised enabled us to move comfortably past the first target for our matching fund agreement to ‘kick in’. Thus another £5,000 has now been added to our growing funds. 1 – Firstly we aim to establish our home base and erecting shop around the Crewe area. There is no need to justify our choice on this point! 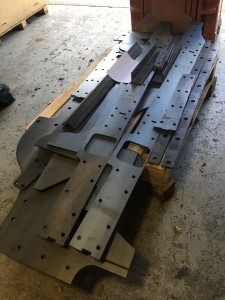 2 – Once our home base is agreed we will be able to order the frame plates; a substantial milestone in building any locomotive, we already have the boiler door. 3 – We will now apply for Registered Charity status (as opposed to being simply HMRC approved). This means we will be regulated by the Charity Commission. Our favourable tax status (which enables us to benefit from gift-aiding on contributions made to us) will continue and our new status will help us when Approaching significant outside sponsors. 4 – We are actively seeking suitable Patrons. 5 – We are also seriously considering fabricating the nameplates if our preferred name is given clearance from the relevant body, a name highly suitable to an LNWR engine and able to, reach an audience much lake 5551 ‘The Unknown Warrior’. The Kidderminster event itself was hugely interesting with such an eclectic and wide ranging mix of stands – from dioramas, models, nameplates, through to the coal tank and our new build display stand. The event featured a broad and interesting set of themes capturing much of what the London North Western was (and the L&NWR Society still is) all about. By being able to talk to the members we gained so much; important information on the Schmidt superheaters; engineering opinions on various LNWR matters; old correspondence from Crewe; donated drawings, pictures, money and other offers of help. It truly showed that the Society is willing and able to help support our project in so many different ways and for this we are very grateful. Tom Mainprize and Paul Hibberd gave a 45 minute talk based firstly around the George’s history pictorially displayed and described, than on setting out the Trust’s current position and how we plan to grow from the base we have built thus far. The final 15 minutes was dedicated to a question and answer session with various points being debated and discussed with present L&NWRS members, the diversity and depth od knowledge of the discussions lead to a very interesting and pleasurable finale to our day. I am Tom Mainprize and work for and with the LNWR GVT in many aspects!, I am also a trainee fireman at Didcot Railway Centre, and I help at PRCLT in the engineering works with 46233 and others., They of course have the LNWR Royal Special Saloon 5000, built at Wolverton in 1923. Your are all probably wondering why someone aged 21 is about to talk about matters relating to the LNWR!… I do not wish to talk so much about the History of the LNWR, there are many far more informed and distinguished people in this room than I who can do the subject justice. 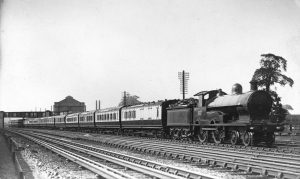 The subject I wish to speak on, is my experience of the LNWR as someone who is from a different generation, someone who has no recollection of Steam on BR as the norm. I wish to tell you the story of how I have become interested, and why I am actively involved in building of an LNWR engine that I can neither remember, nor have ever seen! Railways are in the blood of my family. I still have a granddad who remembers streamlined red and gold, silver and blue Princess Coronations speeding though Lichfield Trent Valley… super Ds, Big Bertha and even the occasional clanking George! I was aware that the North Western had been a really great British institution, but living in Reading it was some years before I had a firsthand experience of its territories. It wasn’t until the age of 8 or 9 that I finally ventured to Euston. My family and i were heading to Scotland on the ScotRail Caledonian sleeper. Arriving at Euston, by taxi you’re thrown into a concrete box, a monolith of ‘Beeching Rail’ and the world of modernisation (something of which I knew little about- apart from the obvious axing of railways). It did not occur to me that this place had ever looked different, but there was something , that for some reason in my mind set it well above Paddington, maybe it was the vast scale of the place, 18 platforms and the Caledonian sleeper, the length of which I had never seen before! Maybe it was the fact this place didn’t reflect its size and importance with a grand structure like Paddington, it just didn’t add up, and I put it to the back of my mind not thinking much of it for many years to come. This experience which I have told you about has precious little to do with the LNWR bar the metals and places we were on. And that was the problem– I’d been to Euston but not found Euston!. It was through my readings that I finally found the conclusion to my tale, the callous wanton destruction of such a Historic and Iconic terminus. More reading followed and led me to the sad story of the LNWR, second best not only in 1923 but in 1961-2, it left a vivid impression on me: The Doric Arch- Gone, The Great Hall- Gone, Old Euston- Gone, Old New Street- Gone. Curzon Street- my only tangible link to LNWR infrastructure. Of the locomotives it’s a similar story- the famous picture of a Precursor, Prince of Wales, and Claughton lined up at Crewe ready for the cutters torch says it all. What we have left we must cherish and appreciate, they really show the glory of the ‘Premier Line’- the best coaches in the country (IMO) many survive thankfully, Cornwall, Hardwicke, and the only two working examples; the Super-D and the resplendent coal tank. There is something telling me, ‘although we are very lucky to have these pieces, the LNWR faces becoming a distant chapter in our railway history’ … Why you ask? The LNWR was once the largest joint stock company in the world, but how many people actually know or remember anything about the LNWR? Even here in Crewe I’m sure average Joe couldn’t tell you why there is a road named ‘Claughton Avenue’. Maybe I am overly sceptical, but through my own experience within railway circles I heard very little about the Premier Line and I wonder how many railway enthusiasts of around my age know much about the LNWR? … I want to help correct this. This leads me to my final words, the LNWR George the Fifth new build project is the perfect project to do this. We have an opportunity to build an LNWR express locomotive of the 20th Century and fill a big gap in LNWR heritage. It is not that other LNWR projects aren’t worthy projects; far from it they are hugely important. But this can be the flag bearer for the LNWR- a mainline engine, capable of feats not seen since Wild Duck, Deerhound or any of the other Iconic names that disappeared as it seemed for ever in 1948. An engine that will, not only be of national importance but one that ‘average Joe’, railway enthusiasts and the like will come and see, I have seen it first hand with Tornado. This George will in my eyes help revive the LNWR– the Premier Line to greatness. The commitment, along with an engine must be to excite and educate people… most importantly the next generation on the LNWR, so that this George, will in part be a platform for enthusing the next generation on the LNWR and the great history with all that has been lost. We thus achieve many things with one project, these are things that the preservation movement is grappling with and reaching inadequate answers to thus far. We can lead the way. Just like the LNWR of old. My message is therefore simple; join the George the Fifth new build project; donate if you can through subscribing or a one off donation and be part of the revival of the LNWR- and its new chapter in history. The Trust has now raised over £10,000, a fantastic start! It is now possible to move forward by setting up a home base, hopefully at/near Crewe, and getting the frame plates cut. Along with gaining charitable status and etching the nameplates we hope that you can witness our project really progressing towards its stated goal of manufacturing a ‘Crewe-Built’ LNWR 4-4-0 for the mainline. This could be the only chance to get such an LNWR engine back on the mainline where it belongs. With an estimated price tag of £1.5million we still have a long way to go. However, the generosity already shown by the L&NWRS and its members has been crucial to our early success without which the project would still be only a pipe dream. This is no longer then case. Money is our biggest obstacle to progress and the larger the volume of people donating either through a subscription or as a one off (no matter how small) edges us forward to the day where we can lift trains up Camden Bank once more! Help us maintain the momentum of this life changing moment by continuing to support our George the Fifth New Build project. Finally special thanks are due to Brian Hayes for overseeing such a very successful event. 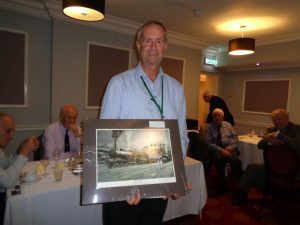 17 November – Tom Mainprize gave a talk to the 23rd Annual Crewe Luncheon of the L&NWRS. 8-10 June – RAILFEST. We attended the event and exhibited at stand 30. We had photos of George the Fifth at Camden, quarter scale live steam “Loyalty”, Wolfhound, “Coronation” ex-works at Crewe in 1911, “Malta” at Euston from Liverpool and “T J Hare”. 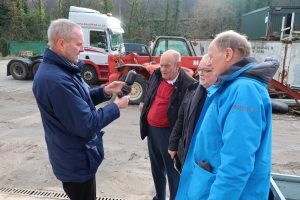 The highlight of the event was the presentation by Robin Dean to the Group of an ORIGINAL WHISTLE which it is intended to renovate and use in due course. 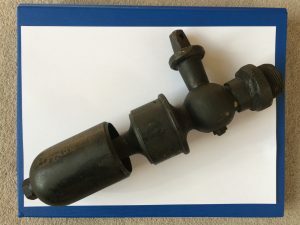 The LNWR whistle was originally fitted with an ‘acorn’ finial. A plain nut was substituted in round 1909. 1 – FORMATION OF A STEERING GROUP. After the LNWR Society AGM last May we formed a steering group of four: Paul Hibberd, Derek Buckles, Ray Berry, Drawings Officer of the LNWR Society and me. Since then we have held two meetings and have made considerable progress, allocating roles and drawing up a strategy. However, sadly Ray Berry, a gifted engineer and scientist who was an enormous asset, died suddenly earlier this year. We organised a display for the LNWR annual dinner last year. We are most grateful to the LNWR Society, Chairman Peter Stanton and several pf their officers for the tremendous support they have given us. 2 – CHARITABLE TRUST. We have formed the LNWR GEORGE THE FIFTH STEAM LOCOMOTIVE TRUST. Paul Hibberd, Derek Buckles and I are directors and trustees. We are getting quotes for indemnity insurance; we have opened a bank account. We are preparing standing order forms at various levels along the lines of the B17 new build project. Once this and one or two other items are completed we will launch our campaign and invite you to subscribe and help us recruit subscribers. 3 – COVENANTERS (REGULAR SUBSCRIBERS). Crucially the project to build a new LNWR George the Fifth locomotive must put itself in front of the public and persuade people to become covenanters (regular subscribers). We’ll be sharing a stall with the B17 project – see next item. This is exactly the mechanism that was used to create Tornado (and other replicas that expect to succeed). 4 – NRM RAILFEST. An important opportunity to promote our project has come up in the form of the NRM Railfest. This is being held at NRM York in June. It has not happened for seven years or so. It is a high profile event. Hardwicke, G2 Super D Goods and the Coal Tank will be there. We shall have a presence there and the B17 project are generously sharing their stand with us. We’ll be manning the stand and telling the public about our project manning and recruiting covenanters (regular subscribers). Friday 8 June through to Sunday 10 June. We are in the process of creating an attractive display which will include a video showing the construction of “Coronation” and its emergence from Crewe Works in shiny black gloss. So do come, visit our stall and give your support. If you want to join us contact Derek Buckles. 5 – CHOICE OF GEORGE THE FIFTH CLASS. We have had discussions about which locomotive and what version to build with a number of people, like Ted Talbot and Roger Bell who bought and saved Princess Elizabeth for instance. These have led us to the conclusion that the George the Fifth was an outstanding performer and would honour Charles Bowen Cook who was one of the most outstanding locomotive engineers of his time. With further improvements it will only offer the best performance for either mainline or heritage lines. 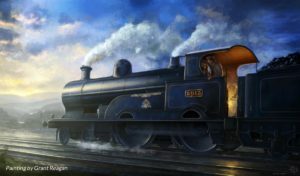 Furthermore we aim to introduce technical improvements to overcome known deficiencies and take advantage of modern technical developments and building techniques to produce an even more distinguished locomotive. This will make it a project with appeal to engineers. 6 – DRAWINGS. Paul Hibberd and Ray Berry spent a day at NRM and established that there are sufficient drawings at NRM> Ray came back with copies. We are in discussions to find someone who may be able to fill Ray’s role. 7 – FINANCIAL BACKING. We have a donor who wishes to remain anonymous. He has offered £50k in five year tranches of £10k provided we match these sums. Currently we estimate a rough £1.5m for the construction. This is a relatively small sum compared with the cost of building much larger locomotives and certainly achievable if we are well organised and determined. 8 – WEBSITE. With the generous help of Grant Regan we are designing a website. He’s passionate about steam locomotives. He is an illustrator and designer by profession but with a calling to hand-build bicycles (bicycles and cycling being another passion). He’s an Australian currently living in Norway with his Norwegian partner. Grant first spotted us in the “New Build” website to which he has submitted information and pictures about our project. There is a picture of our fun day out at the steaming of the quarter scale George the Fifth named Loyalty at Audley End last summer. Grant is also a talented artist and has provided us with a beautiful painting of a George at speed in the night, far more evocative than any photograph could ever be. 9 – MUCH MORE TO DO. We shall be seeking other team members to fill the required roles and backers, a base for the project and construction of the locomotive and heritage lines that would be interested in using this superb locomotive. 10 – PUBLICITY. Crucially we shall be preparing a press release and writing new articles for Steam Rail, Heritage Rail and the Railway Magazine. A locomotive with a royal name, possibly named Coronation should have considerable appeal and we hope to have a replica nameplate at Railfest. 12 March – Trust applies to HM Revenue & Customs to become a Charity for Tax purposes. Approved on 24 April. KEY NEXT STEPS: Bank Account, HMRC Application, Appeal Brochure, Newsletter, email to supporters, website, prepare for YORK. We also discussed a suitable location for the project (Crewe? ), adding more Trustees and deepening our link with the L&NWR Society. 5 January – LNWR GEORGE THE FIFTH STEAM LOCOMOTIVE TRUST came into being. 29 October – Initial Steering Group meeting. Items discussed included finance, advertising, website, initial action planning. 14 May – Bruce Nixon and Paul Hibberd attended the L&NWR Society AGM at Quainton, Buckinghamshire and gave a presentation. Derek Buckles volunteered and the initial Steering Group was formed. Visit our Progress/Blog page to keep up-to-date on our progress. Building an historic locomotive from the ground up is no small task. Could you help us make the dream a reality? There are a number of ways you can help the Trust, from direct donations, volunteering of skills, word of mouth, and many more. Visit our Can I Help Page to learn all of the options available.